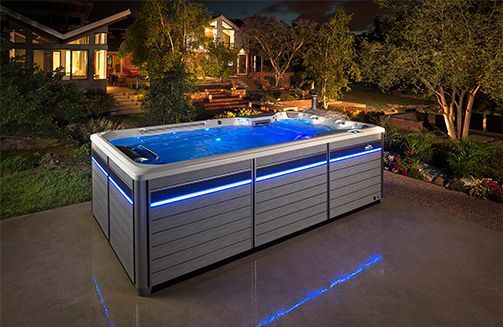 A swim spa is an oversized spa pool that has been cleverly designed to allow you to swim, jog and work out using the power of jets to keep your motion stationery. Swim Spas provide a low-impact workout, set at the pace you want to train at – with all the benefits of hydro-therapy and massage while you workout. You can include intense strength and resistance training or opt for lighter walking or swim exercises. Then relax and soothe tired muscles in the comfort of the integrated spa pool. And because swim spas are usually larger than normal spa pools you have more room for relaxing or more room for family and friends. 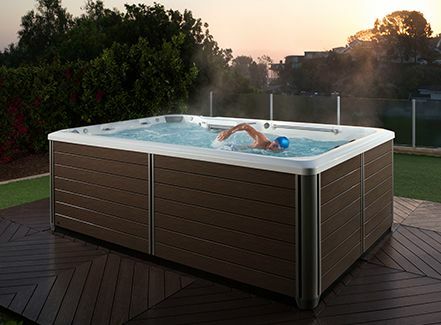 A Swim Spa/Fitness System, from the makers of HotSpring Spas, truly is a versatile option for the backyard or deck. Enjoy backyard living at its finest with a pool and spa all in one. Swim, exercise, enjoy increased quality time with your family and friends. Our beautifully sculpted spa combined with hydrotherapy jet seats, an underwater treadmill and the Swim Spa swim current turns your home into an oasis for year-round exercise, relaxation and fun. No other pool offers such a complete solution for your health and well-being. What if you could achieve your wellness goals within your private space? Our homes are more than just a refuge; they are a sanctuary from the stresses of our busy lives. Introducing the all-new Swim Spa / Fitness Systems, where you can swim, run, exercise and relax all in one place, all within the privacy of your own home. The E500 combines beautifully functional design with the innovative Swim Spa Swim Machine and optional treadmill for a variety of fitness options. The versatile E500 is built to provide a space where wellness goals are easily incorporated into your daily routine. 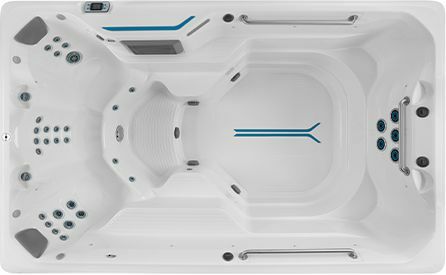 The E700, our 5.18m Fastlane Pools Fitness System, gives you a more comfortable swim spa environment for swimming and total-body fitness. Our signature Fastlane Pools Swim Current comes standard, so you’ll enjoy the best swim spa on the market. For low-impact jogging and walking, add our Underwater Treadmill (available on the 147cm deep model). Aquatic running burns just as many calories, but without the pounding of dry-land activity. It’s an excellent exercise to manage or prevent joint pain and overuse injuries. The E700’s jetted hydro massage seats let you relax after a tough workout. Or power up the jets for an invigorating morning wake-up! Each ergonomically designed seat has a unique configuration of jets – choose the right one to target your sweet spot, or rotate among them for total-body relaxation. 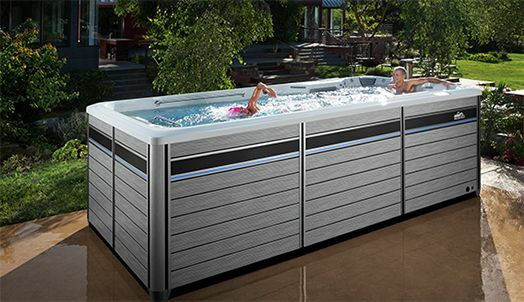 The durable, steel-framed cabinet has sleek, modern swim spa styling that’s virtually maintenance-free, so the E700 brings both beauty and functionality to your home. With your choice of options – from a deeper model for chest-deep aquatic exercise to an Underwater Treadmill – you can truly make it your own. The E200 allows you to have it all with our industry’s best swim-in-place experience. With a dedicated spa side you can have different temperatures on both sides – independent of each other. We’ve paired the industry leading Fastlane Pools Swim Machine with our optional underwater treadmill, low-impact exercise equipment plus relaxing warm water hydrotherapy. Swim, run, exercise and then relax, all in the privacy of your own back yard. A sunrise swim or rigorous aquatic workout clears your mind and leaves you with a sense that there are unlimited opportunities for the day ahead. This day is made possible by the all-new SwimCross™ exercise system, from the makers of Hotspring Spas. 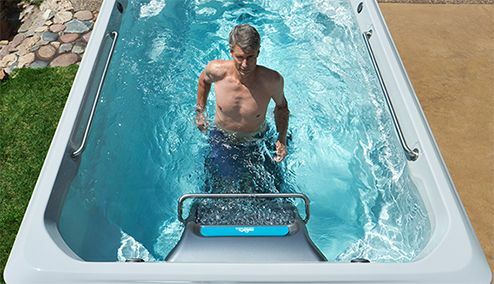 The X200 blends the functionality of swimming and exercising in the privacy of your home with a uniquely beautiful design that puts the SwimCross exercise system in a class of its own. Nothing is more refreshing or rejuvenating than a swim or an aquatic workout in the privacy and convenience of your own home. 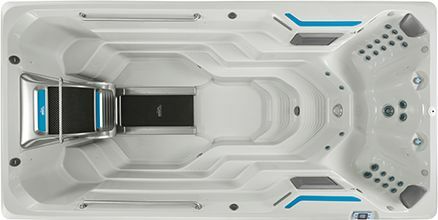 Hotspring, the makers of SwimCross™ Exercise Systems, introduces the X500 Swim Spas. Not only visually stunning, the X500 was purposely designed for any level of user to attain a complete body workout. Enjoy backyard living at its finest with a pool and spa all in one, a Swim Spa. Swim, exercise, enjoy increased quality time with your family and friends. 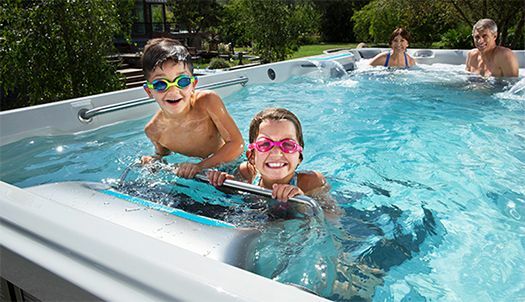 Our beautifully sculpted swim spas combined with hydrotherapy jet seats, an underwater treadmill and the Swim Spa swim current turns your home into an oasis for year-round exercise, relaxation and fun. No other pool offers such a complete solution for your health and well-being. There’s no better way to end your day than with some aquatic exercise followed by a relaxing massage. 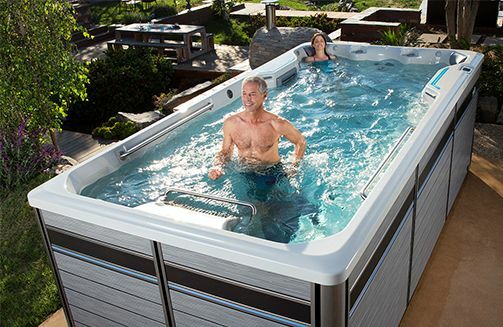 If you want to improve your fitness, relieve pressure on your body or melt away the stresses of daily life, Swim Spas / Fitness Systems are the intelligent option. Our Swim Spas offer the perfect choice for those who want the best of both: a luxury spa and fully-adjustable swim speed current, all-in-one.